Just when I'd really gotten on a roll with posting regularly (every weekday for eight in a row! ), I lost my posting mojo late last week. While I search for the errant mojo, please allow me to briefly distract you wilth a picture of a baby sweater! I'm happy to report that this second attempt at the Last-Minute Knitted Gifts plackett sweater went much more smoothly than the first. The yarn is Jaeger Baby Merino in Yo yo (best colorway name, ever). 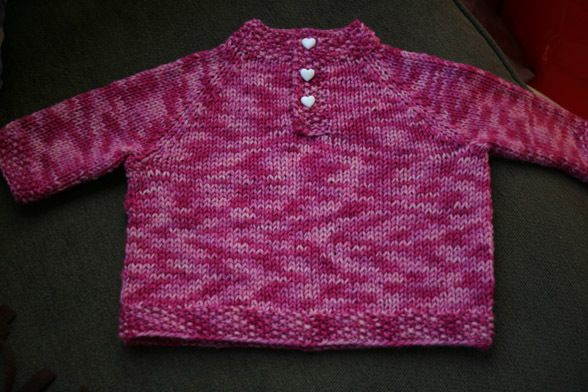 It was knit at high speed for a baby whose arrival date was estimated to be Christmas, but had remained so modest during scans that her gender (and, by extension, yarn color choice) could not be determined until early December. Of course, the sweater arrived in time for her due date, and the little monkey didn't arrive until January 5. That meant my poor friend, a card-carrying sweet-tooth who had been forbidden to eat sweets due to gestational diabetes, suffered through Halloween, Thanksgiving, Christmas, and New Year's without so much as a cookie passing her lips. I'm sure those must have been the 10 longest days of her life. I'm also sure it was totally worth it. Now, I'm off to find the mojo. Wish me luck! Hee, those heart buttons really make the piece. Oh, so sweet! I love that yarn knit up. It just looks great, and I'm sure it was super appreciated. I feel for your friend with the sweets. It's something I was thinking about today, I don't know how I would survive! We love the sweater and get lots of comments whenever she wears it! I'll send pictures soon, I promise. The way the yarn's variegation knits up is so neat! No weird pooling--it just sort of zigs and zags. What a beautiful gift for your friend. And the buttons really make it.